In the periphery of the Kutupalong camp, humanitarian organisations reinforce the foundations of new shelters built for the refugees. The shelters have been relocated to protect people from potential landslides. August 2017 marked the start of more than 700,000 Rohingya refugees fleeing violence in Myanmar for safety in Bangladesh, joining those who had fled the country previously. 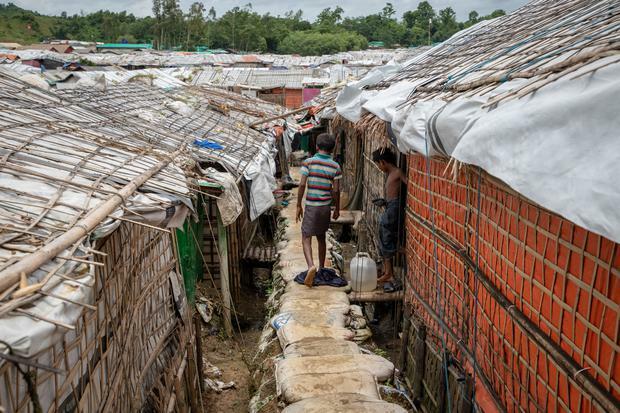 Today, nearly one million Rohingya refugees live in camps and makeshift settlements across Bangladesh’s Cox’s Bazar peninsula. Between August 2017 and December 2018, teams from Médecins Sans Frontières / Doctors Without Borders (MSF) have provided one million medical consultations to refugees and the local community. Medical coordinator Jessica Patti describes what MSF teams found and where they plan to focus their efforts next. A child walks on an elevated foot path reinforced by sandbags in the Unchiprang camp in Cox’s Bazar, Bangladesh. Almost 9 percent (92,766) of our 1.05 million consultations were for acute watery diarrhea, most of them children under five, who are particularly vulnerable to the condition, and who can die if it goes untreated. While severe cases need to be admitted to hospital, most people can go home after being properly rehydrated. Diarrhoea is related to the poor and overcrowded living conditions in the camps. Often refugees live in small shelters built from bamboo and plastic sheeting and shared with many family members. Clean drinking water and well-maintained latrines are key factors in preventing diarrhoea, and health promotion activities focusing on improving hygiene are crucial. Poor living conditions are also behind all the other main diseases we treat. These are upper and lower respiratory tract infections; skin diseases; and fevers of unknown origin, which can be hard to diagnose when laboratory services are not widely available. People need more space in the camps. This would mitigate the spread of some viral infections. The simple practice of washing one’s hands with soap and water would help to prevent many of the skin conditions we treat, such as fungus and scabies. But when you live in a refugee settlement, where clean water is scarce, washing one’s hands isn’t so simple. That’s why water and sanitation activities have been such an important part of MSF’s work. So far, our teams have distributed 87.8 million litres of clean water in the camps. In the early months of the emergency, medical organisations and the Bangladeshi Ministry of Health responded to various outbreaks of disease – a result of the low immunisation coverage and limited access to routine vaccinations and healthcare available to Rohingya refugees in Myanmar’s Rakhine State. Since August 2017, MSF teams have treated 6,547 people for diphtheria and 4,885 people for measles. While these represent barely 1 percent of our total consultations, the quick response to these outbreaks was crucial. Since then, a number of vaccination campaigns for diphtheria, measles and cholera have been carried out. In any emergency involving the mass displacement of populations, the first thing you try to do is to vaccinate for measles as it is a recurrent disease. The emergence of diphtheria was more challenging, as outbreaks are a rare occurrence, and most of our medical staff had to learn how to treat it from scratch. Today, people in the camps are better protected from disease outbreaks, and our teams continue to do routine vaccinations, but the risk still exists. In recent weeks, for example, we have treated several hundred cases of chicken pox, a disease that is uncommon in South Asia and can have complications for pregnant women, or when the person who catches it is also suffering from other diseases. Most of the Rohingya have experienced traumatic events. Many have suffered or witnessed violence and lost close relatives and friends. A lot of people would like to go home, but that’s not possible. So they feel hopeless. Since the very beginning, providing mental health services has been a priority. Mental health consultations represent 4.7% (49,401) of our total consultations so far. Mental health services are unfamiliar to many people, and are sometimes stigmatised, so we have had to create awareness of our services, and we need to continue to do so. Our teams provide individual and group sessions, do psychosocial stimulation for malnourished children, and treat people for psychiatric conditions. This appears to be helping them: drop-out rates are low and there are a good number of discharges, which implies improvements to people’s mental health. 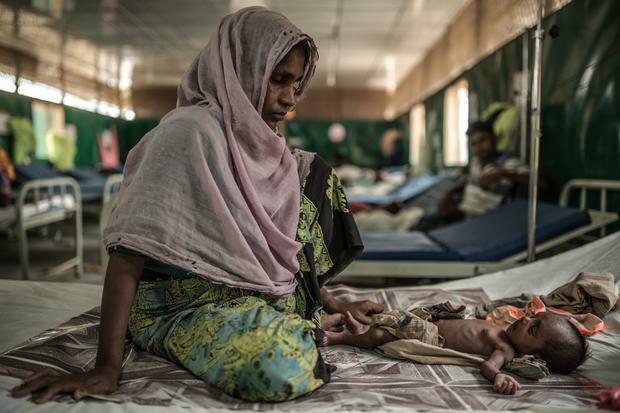 Rozia and her two-month-old son Zubair in the MSF hospital in Goyalmara. Many of the children admitted to the hospital have contracted infections from unhygienic birthing practises, and the unsanitary living conditions in the camp during their first days of life. Chronic diseases, such as diabetes and high blood pressure, are common amongst our patients, particularly the elderly. However, this is a significant need that is not being properly met. When we receive patients who need urgent treatment for chronic diseases, we stabilise them and then refer them to another medical organisation for longer-term care. Among children, there is also a significant prevalence of thalassemia – a congenital disease which is difficult to treat and requires blood transfusions. Unlike in other contexts where MSF works, deliveries represent a small proportion of our consultations – our teams have assisted just 2,192 births. This is because most women choose not to give birth in hospital. Usually they give birth at home, attended by traditional birth attendants, as they did in Myanmar. But when home is a basic shelter in an overcrowded camp, it is a worrisome situation that we would like to change. Those women who do come to hospital to deliver often arrive very late, without seeking antenatal care beforehand. Antenatal consultations made up just 3.36% (35,392) of total consultations. As a result, our medical staff often see women with conditions such as pre-eclampsia, eclampsia, prolonged labour and retained placentas. At the start of our emergency response, we treated some people for violence-related injuries suffered in Myanmar, and basic healthcare was much needed. Today, the patients we treat for violence are more often injured in incidents happening in the community or family, and events of sexual gender based violence. The major needs are for secondary healthcare, including non-communicable diseases. As at the beginning of the emergency, though now for different reasons, sexual violence remains an important focus. A number of women arrive at our facilities with sexually transmitted infections that have gone untreated for a long time. 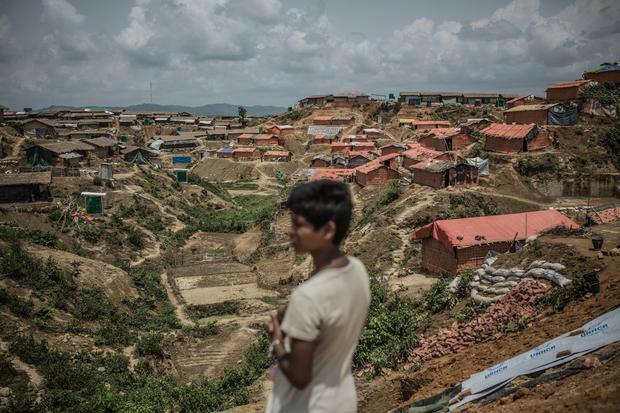 MSF’s continued presence in the Cox’s Bazar peninsula is also leading to an increase in consultations for members of the local Bangladeshi community, particularly in those health facilities that are not located in the middle of the camps.